Throughout the year we will have many representatives come visit to talk to students. Please make sure you sign-up in advance! Many different topics including Introduction to College Admissions, Importance of College, Access to College, Making High School Count, High School Classes, Extracurricular and Leadership Activities, Standardized Tests, Exploring College Options, College Search, Campus Visits, Applying to College, College Application Process, Admissions Essays, Letters of Recommendation, Paying for College, Financial Aid App Process, Grants and Scholarships, Work Study, Loans, Financial Aid Packages, and Post College Acceptance!! 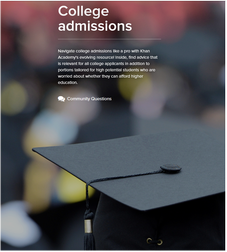 This handbook contains current information on admission requirements, campus characteristics, program offerings, and application procedures for each college and university in Michigan, as well as information pertaining to the various private occupational schools that are licensed or approved by Michigan agencies. Advanced Placement program information is also provided. Visit the Michigan Postsecondary Handbook website and use the dropdown box to access specific topics within the handbook. These are opportunities for students to visit college campuses outside of school. One of the best ways to find out if a college/university is right for you is to visit the campus. Get your family and friends together and schedule a tour!! All students attending Explore Eastern can apply for admission FREE of charge—a $35 savings.